One evening in March 2007, the United States ambassador to China, Clark T. Randt Jr., hosted a dinner at his Beijing residence for Xi Jinping, who was then the Communist Party chief of Zhejiang Province, in which the two discussed, among other things, the merits of various films and filmmakers. Youngsters today “dare to think and act, and that could be a little dangerous,” said Ruby Yang. Mr. Randt mentioned that a documentary on orphans in central China whose parents had died of complications related to AIDS had just won the Oscar for best short documentary film. Mr. Xi, who is now the Chinese president and head of the party, said he was aware of the film, “noting that the director is a female overseas Chinese,” according to a State Department cable obtained by WikiLeaks. That director is Ruby Yang, a native of Hong Kong and longtime resident of San Francisco. 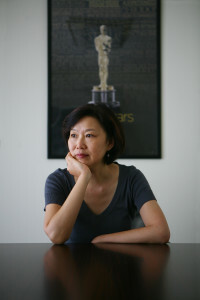 Although Ms. Yang might be best known for her Oscar-winning work, “The Blood of Yingzhou District,” released in 2006, she had already earned a reputation before that as an astute chronicler of young people caught in the middle of societies in flux. One notable work was “Citizen Hong Kong,” a feature-length documentary that Ms. Yang made around the time of the end of British colonial rule in Hong Kong in 1997, when the global financial capital was returned to China. The film, which was released in 1999, was an exploration of Hong Kong identity through the lives of five young people who recorded their daily activities and musings for Ms. Yang with video cameras she had given them. In your new film, you follow students from several Hong Kong high schools as they try to put together a musical. What did you learn about Hong Kongers of this generation while working on your documentary? I started filming for this documentary in the spring of 2013 and spent 18 months in production. The Hong Kong school system is known for its competitiveness. The young people featured in the film are ages 15 to 18, in grades eight to 12, enrolled in Hong Kong’s less-desirable schools. Four students are from a school for the blind. They mostly come from disadvantaged family backgrounds and face personal challenges like low self-esteem, staying focused and family issues. The film chronicles the trials and tribulations of this group of students as they underwent six months of vigorous training to produce a musical onstage. A life-affirming journey of self-discovery and growth, the stories of these young people will challenge every parent, teacher and policy maker in Hong Kong to reflect on our way of nurturing the young. How did your experience making this film affect your initial reaction to the student-led protest movement, especially over the weekend of Sept. 26, when it became a wider populist uprising and caught the world’s attention? “Tell us five adjectives you’ve chosen to describe yourself,” a teacher at the music training camp said. The traits of Hong Kong youngsters like Ah Bok are total free rein, inventiveness and quick reactions. This young generation that’s just about to come of age were all born after 1997. With social media, they know more and demand more. They can go into the bathroom and use their phone to send a message to a friend without their parents knowing. Without work experience or any setbacks in their lives, they are fresh and idealistic. They dare to think and act, and that could be a little dangerous. Your film had its premiere in Kowloon on Oct. 7, after the protests had gone on for 10 days and thrust Hong Kong into the global spotlight. The premiere was well-attended by people from many walks of life in Hong Kong, including vice chancellors of universities where students have been very active in the movement. What kinds of discussions took place at the premiere? The premiere was planned months ahead. It was a charity gala for The University of Hong Kong Foundation. All the students, their parents and the teachers featured in the film were on stage to greet the audience after the screening. One of the vice chancellors gave his business card to Calvin, a student subject in the film who failed to get into university. The vice chancellor encouraged him to make an appointment to see him at the university. There were discussions of how to help more under-privileged students overcome the challenges they face to become more positive and perseverant people. Around July 1997, when Britain handed Hong Kong back to China, you began making a film, “Citizen Hong Kong,” in which you followed five young Hong Kongers to get at the question of Hong Kong identity. What did you discover during the making of that film? People were more confident about their identities even though they were unsure of their future. There was curiosity about China. The new immigrants from mainland China then were very agreeable about their children taking part in the film. There were fewer media stereotypes of mainlanders. How has Hong Kong identity changed since then? You’ve spoken of sensing a growing polarization in Hong Kong society. For the younger generation, there is growing detachment toward mainland Chinese culture. For example, there is less interest in films and documentaries made in China or about China. Hong Kong people have begun to take pride in things “Made in Hong Kong,” focusing more on local culture and its heritage. On the political front, the recent Occupy Central movement has caused rifts among family members, silence during family dinners. I know of a mother who forbade her teenager daughters from joining the protest. The girls cried for days and would not speak to the parents for the entire week. Many of my friends would avoid the subject altogether because they know it would cost them their friendships. Were you surprised at the number of people, especially young people, who took to the streets in a civil disobedience movement after the initial student protest at Civic Square on Sept. 26? Why do you think people feel so passionately at this moment? Do you think the protest movement — the Umbrella Revolution, Umbrella Movement or Occupy Central, whatever you want to call it — can change anything substantial about this city? With the situation right now, it’s hard to predict where the long-term effects of the protests might lead. Change isn’t always dramatic; sometimes it is an evolution. What are you hoping to do with your next projects, and how do you plan to split your time among Hong Kong, mainland China and the United States? I will be based out of Hong Kong for the next three years and continue to explore themes that relate to Hong Kong and China for my future projects. The original post was published on New York Times Sinosphere on Oct 16, 2014.